In the AD&D Monster Manual, Orcus is described as "a grossly fat demon lord", but in 2nd edition he started becoming more muscular, until by 4th edition he had the look of a professional bodybuilder. 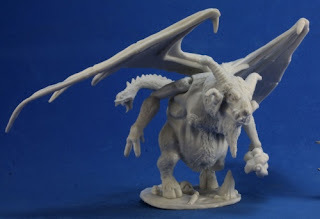 Reaper Miniatures has produced a couple of figures that can be used to represent Orcus. 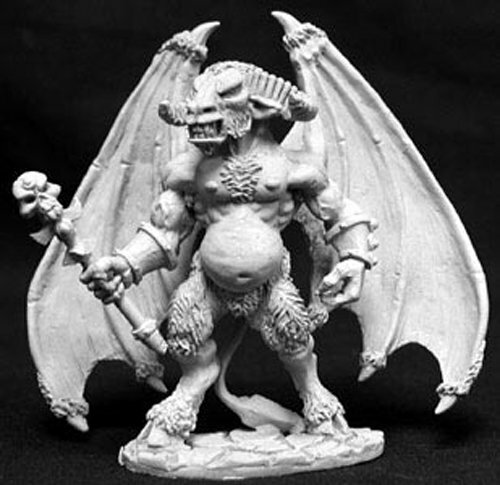 Their first effort (which I didn't care for) was like the 2nd edition D&D version of Orcus, being muscular, but with a pot belly. 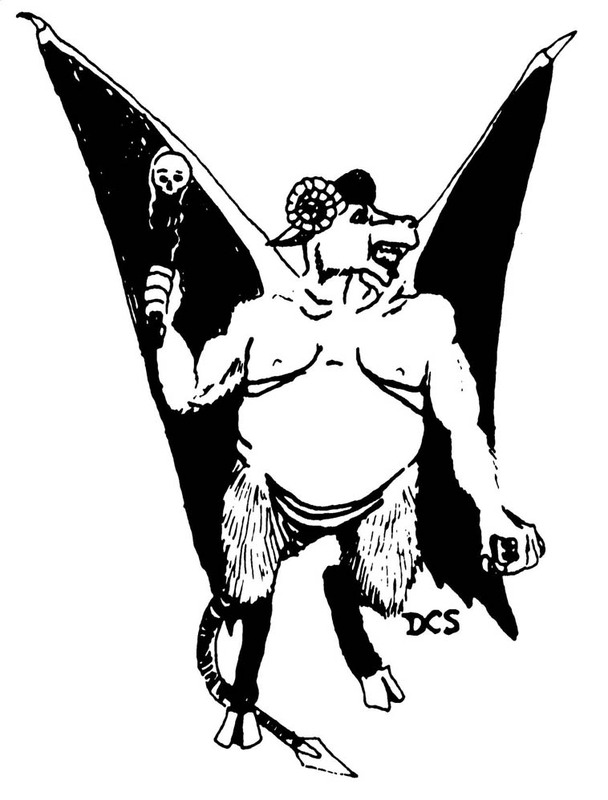 Their second version of Orcus was the Demon Lord of the Undead (Bones 77316), and he looked like a genuine grossly fat demon lord. 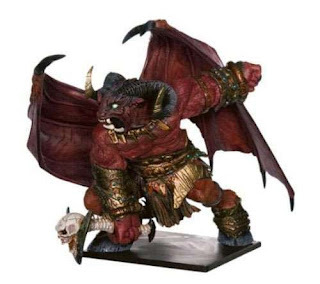 There were a few things about the model that I wanted to change because this was not the version of Orcus that I envisioned. Some of the features that needed to be altered were the Jacob sheep horns, pentagram on the forehead, three fingered hands, and tail ending in a snake head. 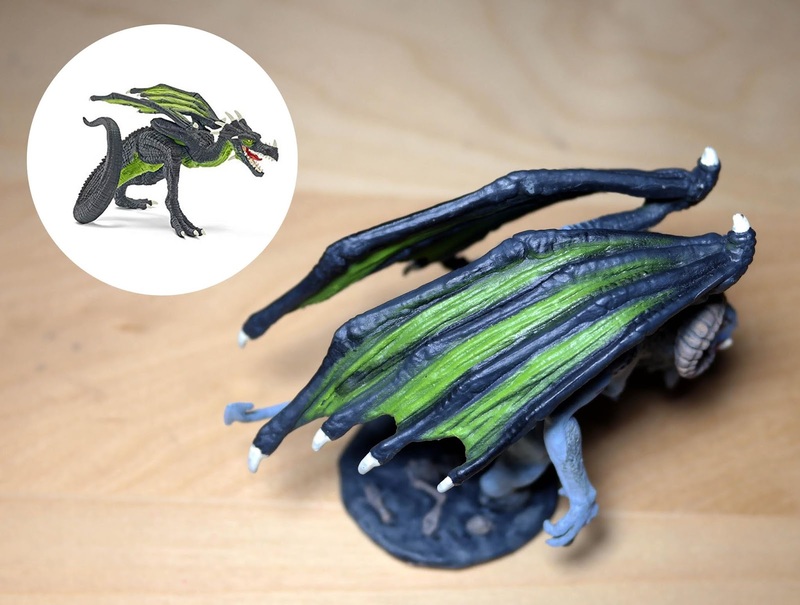 The wings were also spread out, which I find ill-suited for miniatures that are presumably walking on the ground (not to mention how unwieldy they are for gaming). 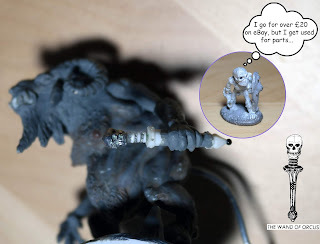 Lastly, the Reaper wand ends in a cluster of skulls, kind of like the Geballte Ladung equivalent of the Wand of Orcus. This had to be fixed. I cut off the original horns, and replaced them with the horns from a brass ring that I found on eBay. 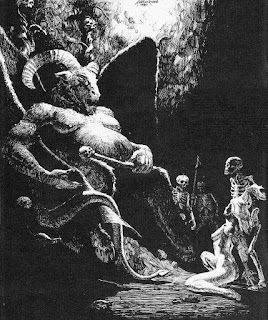 The pentagram was covered up with Kneadatite. 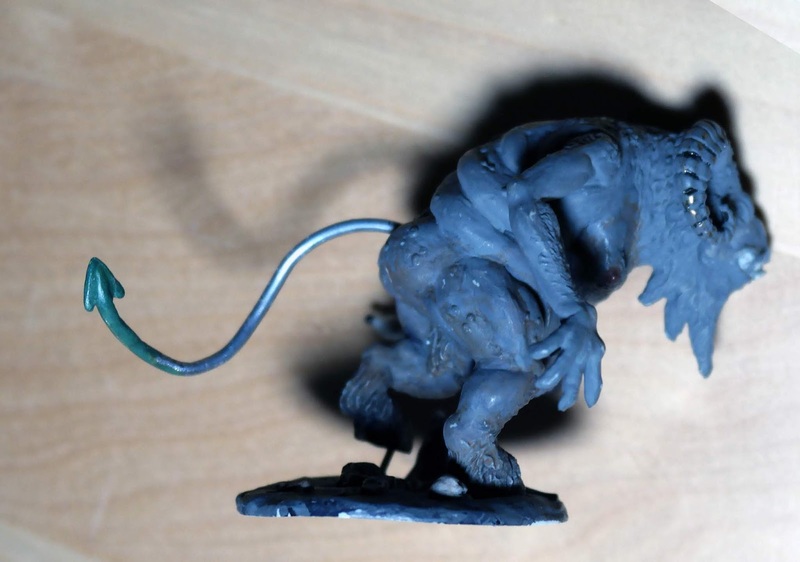 I added a tail made from a soft steel rod. The forked-tail and two additional fingers were built up with Kneadatite. The Wand of Orcus had the multiple skulls replaced with a single dwarf skull from an old Citadel skeleton (FTS11). Various glass beads were added to make it look more like the Sutherland version of the wand. Two additional fingers gripping the wand were built up from Kneadatite. 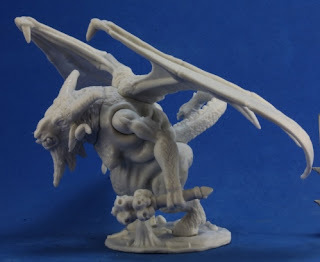 The most difficult part of the conversion was trying to find some furled wings. I don't know how many extraneous miniatures I had to get before I found wings (from the Schleich Dragon Runner) that were the right size for this figure. I'm almost finished with painting the figure, but I think I need to rebase him on a heavy washer or a larger base because he is front heavy and tips onto his nose quite often. Cool stuff. 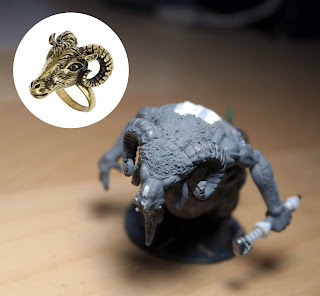 Looking forward to seeing the finished miniature.